This four-year programme offers the opportunity to develop expertise in two ancient languages simultaneously, focusing on Greek in year two and the final year. The curriculum is the same as that of the Greek with Latin BA, with an additional opportunity to spend year three at an approved university abroad. Greek at grade A required. A score of 17 points in three higher level subjects including Greek at grade 6, with no score lower than 5. A score of 16 points in three higher level subjects including Greek at grade 6, with no score lower than 5. Successful completion of the WBQ Advanced Skills Challenge Certificate plus 2 GCE A-Levels at grades AAB, including Greek at grade A.
UCL is ranked in the top three universities in the UK for Classics by the Guardian University Guide 2018. You will have access to an unparalleled range of optional modules, from Roman Love Poetry to Greek Palaeography, from Ancient Greek Religion to Roman Epic. UCL has excellent library facilities, and is ideally situated close to world-renowned resources such as the British Museum, the British Library, and the Institute of Classical Studies. The lively student-run Classical Society organises an annual Classics play (a Greek or Latin drama in translation) shown at the nearby Bloomsbury Theatre, as well as other events. The main emphasis of the programme is on the study of Greek and Latin texts in the original language. The choice of optional modules is very wide, but the language element follows a set pattern. You must take at least 1.0 credit of Greek-based modules and at least 1.0 credit of Latin-based modules in your first year, and can then concentrate on Greek-based modules in your second and final years. In addition, there are some compulsory modules in the first and second years involving texts in translation. You will select 1.0 credit from a wide range of optional modules. You will select 1.5 credits from a wide range of optional modules. Year abroad at an approved university. You will select 2.0 credits from a wide range of optional modules. You will be taught through lectures, seminars and small-group work. Some sessions involve direct study of artefacts, including access to the collections of the British Museum. Most modules combine both continuous assessment and end-of-year written examinations, although a few modules are assessed solely by one or other of these methods. 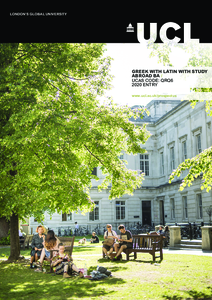 Detailed course descriptions are available on the department website: Greek with Latin with Study Abroad BA. Knowledge of languages such as Greek and Latin will help you to develop mental agility and versatility, equipping you with the ability (amongst other things) to learn modern languages with comparative ease, opening up a wider range of possibilities in the future. The Greek with Latin with Study Abroad BA is a rigorous and broad-ranging degree which qualifies you for a remarkably wide variety of jobs. The Classical Society hosts regular talks from former students which may help guide you in your future career choices. Career destinations in recent years have included: graduate study, teaching, law, computing, accountancy, marketing, banking, music (classical and popular), acting, the media, business, the voluntary sector, local government and politics. Entry to the degree is competitive so it is important you highlight your interest in and passion for the subject in your application. In addition to meeting the academic standards stated, we look for dedication and self-motivation, good communication skills and a real enthusiasm for your chosen area of study. Each application is carefully assessed. Those candidates being considered for an offer will be invited to an applicant open day, which will include a lunch with staff and current students where you can discuss the degree programme, living in London and studying at UCL, and take a tour of the campus.